Is this the new clutter-free Android dialer? 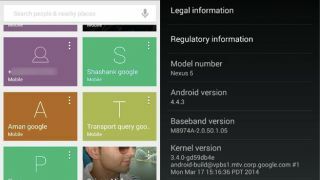 A leaked screenshot purportedly showing a revamped Android dialer has emerged online, suggesting the feature may be included in a forthcoming KitKat update. The picture, unearthed by the XDA developers forum, showcases a colourful card-based UI complete with contact photos or, in the absence of a photo, the contact's first initial. The new UI mirrors that of the Gmail app, but it appears Google is bringing the cleaner, less cluttered experience to Android KitKat calls. Within the screenshot, the contact search bar remains at the top of the screen, while the blue action bar still sits at the bottom. If the redesign is deployed within Android 4.4.3, it's likely to be one of few aesthetic changes brought by the update. The forthcoming KitKat boost is largely expected to tackle bugs such as random rebooting of devices along with Wi-Fi and Bluetooth connectivity issues. Just last weekend Google issued an update for one of its education-friendly apps bringing support for Android 4.4.3, suggesting the rollout could be imminent.